You blew us away with your fantastic support for Library Giving Day this month! You rallied to raise more than $219,000 for this inaugural online fundraising event, exceeding our goal! Your gifts help guarantee that the community will continue to enjoy educational and culturally enriching programs, as well as continually updated books and materials. 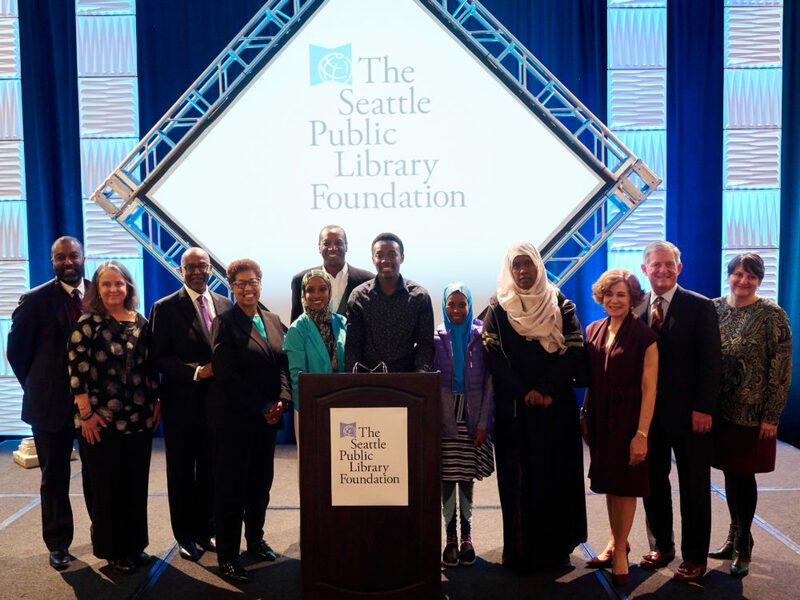 What started as an idea right here at The Seattle Public Library Foundation grew into a movement of 190 library systems across North America, just in its first year! These libraries represented 39 U.S. states and four Canadian provinces. We are thrilled with the turnout of not just donors, but the other libraries who participated, and hope this effort will continue to grow in coming years and amplify libraries’ profile among the public. 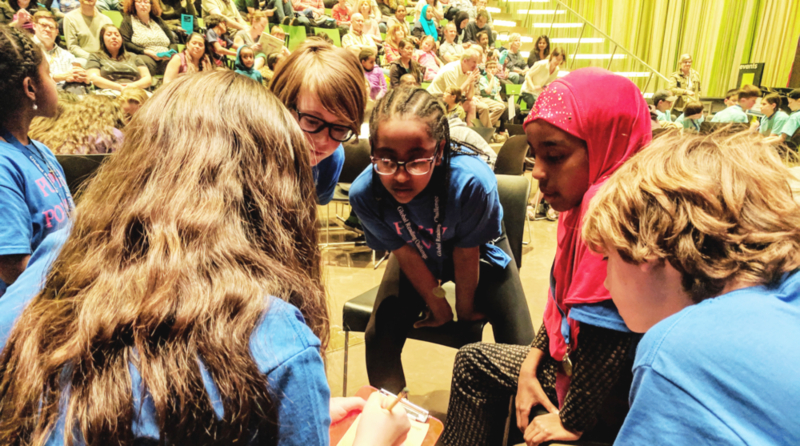 John Rogers Elementary School’s team, The Puppies, discuss a quiz question at the March 19 Global Reading Challenge finale at Seattle Central Library. Fifth grader Saron, center, was her team’s captain. Young readers who packed the the Central Library March 19, culminating months of reading and quizzing, said the best part of Seattle Public Library’s Global Reading Challenge isn’t just the competition – it’s making new friends. The Global Reading Challenge challenges teams of fourth- and fifth-graders from 70 Seattle public schools in a competitive quiz tournament after they read 10 books from culturally diverse authors. 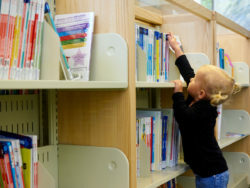 School librarians say they assign teams deliberately to unite children who might not otherwise socialize with each other. The citywide finale last month hosted nine teams and filled the Microsoft Auditorium with fans. The annual program, supported by gifts to The Seattle Public Library Foundation, engaged 4,300 children this year, prompting them to read books that some said they wouldn’t have picked up if not for the challenge – but were glad they did so. “All the books are good,” said Evvi, another 11-year-old fifth grader from John Rogers. She and Saron both picked “The War That Saved My Life” by Kimberly Brubaker Bradley as their favorite of the 10 selections. Parents Candice and Kevin, whose daughter Karissa is a 10-year-old fourth-grader at Cascade Parent Partnership Program, said the program helped their child make friends at her new school and turned her on to reading for pleasure. The culturally diverse book selections help children understand different viewpoints and boosts their empathy for others. The winning team from Bryant Elementary School shows off their trophies. “It really makes them go beyond their comfort zone and they love the books, said Pat Bliquez, school librarian at McDonald International School. It also helps children for whom English is not their first language and makes them excited to learn, said Nancy Fisher-Allison, librarian at John Rogers. Kids shared high-fives and pumped each other up throughout the finale, keeping the contest positive and encouraging. 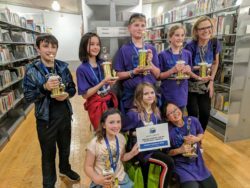 The team from Bryant Elementary School – called “Unusual Students for the Exceptional Librarian” – ultimately took home the trophy, for the second consecutive year. They earned a pizza party with Seattle Public Library’s Chief Librarian Marcellus Turner. 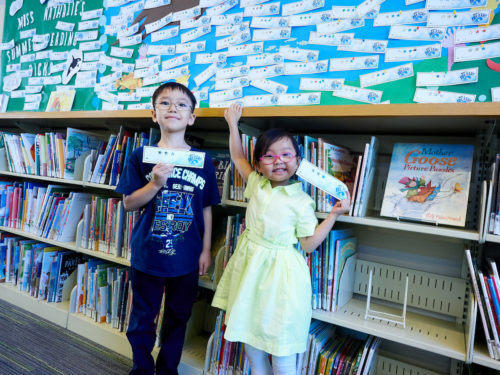 The Seattle Public Library Foundation is leading an international movement to raise the profile of local libraries with the April 10 Library Giving Day. More than 110 library systems in the United States and Canada, including 20 in Washington state alone, are working to raise funds to support our libraries. The Seattle Public Library Foundation supports the purchase of about one in every four books at The Seattle Public Library. It also funds programs such as Summer of Learning, Raising a Reader, Story Time and Library to Business – all with a focus on equity. Help spread the word! Join our Library Giving Day Facebook event page and invite your friends. Share, in person and on social media, how the Library helps you in your daily life and why you give. Then, on April 10, make a gift to The Seattle Public Library Foundation. Each gift up to $45,000 will be matched, dollar-for-dollar, until our match pool is exhausted. There is truly no better time to give! Use the hashtag #LibraryGivingDay on social media. 730 guests united to support The Seattle Public Library Foundation with more than $440,000 raised at the March 5th Discover Your Library luncheon – a jaw-dropping display of generosity that exceeded our goal of $250,000! Want to help a friend, neighbor, or loved one earn $5,000 for college? You can! Make them aware of the Stim Bullitt Civic Courage Scholarship Contest. $10,000 in scholarship funds are available to three Seattle students! Grand prize scholarship is $5,000 and two runners-up receive $2,500. Simply write an essay on civic courage! Submit your essay by March 15, 2019! For information on eligibility and submission details, click here. The International Public Library Fundraising Conference will take place in Calgary, Alberta, Canada this year, hosted by the Calgary Public Library Foundation. The conference is set to take place July 28-30. This is the third-annual conference, which was established by the Seattle Public Library Foundation in 2017. Go the conference website for more information, including registration details. Thank You for Making #GivingTuesday a Success! We are so thankful for your support in making this year’s #GivingTuesday such a success! With your help, and with the $20,000 challenge match from an anonymous donor, we raised more than $60,000 for The Seattle Public Library! Your support puts more books on the shelves and allows the Library to provide innovative services that keep pace with the changing needs of our community. So thank you! YOU are the reason our libraries are so special! The fall edition of The Next Chapter is now available online! 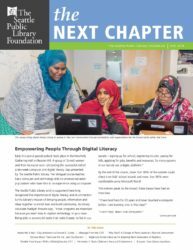 Featuring stories about the Library’s digital literacy efforts, humanities scholar Clay Jenkinson and the latest update on the soon-to-be re-opened Lake City Branch! Don’t miss this opportunity to double your impact with a gift to The Seattle Public Library Foundation. Thanks to a generous challenge match, your donation up to $20,000 will be matched dollar for dollar! Your support means more books, free public programs and innovative new services that help everyone in our community learn and grow. It’s easy to make your gift online and feel really good about making a difference in the lives of people who need, use and love the Library.